I’m geeking out a bit over this guest article. Rev. Dr. J. Philip Wogaman is a titan in United Methodism–and he has a Wikipedia page! 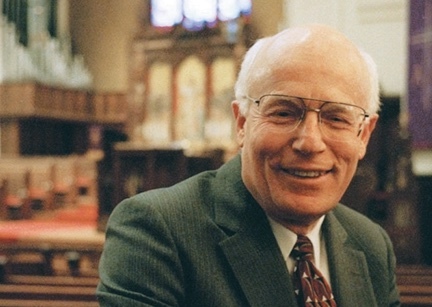 A fellow graduate of Boston University School of Theology, he’s been a seminary professor, dean, seminary president, senior pastor to presidents, and many other inspirational roles over his lifetime. While Dr. Wogaman is retired, he is involved in the politics of United Methodism enough to want to speak out against errors in logic from his long experience as a Christian ethicist. The following is an original essay from Dr. Wogaman that he submitted for publication at Hacking Christianity. Enjoy. The recently concluded special United Methodist General Conference voted against removing policies against Gay and Lesbian ordination and forbidding clergy from presiding over same-gender marriages. The “traditional plan” not only called for maintaining those policies but increasing enforcement. The votes were fairly close, with about 10% separating traditionalists and progressives. The final outcome of the conservative changes awaits decisions by the church’s Judicial Council as to their constitutionality. But, as it stands, the General Conference has reinforced existing teaching and law. Progressives had hoped for a different outcome, providing a way forward for the denomination. With another General Conference set for 2020 an immediate split within the denomination appears unlikely, at least for now. But the conflict remains, now exacerbated by the 2019 Conference. One of the church’s existing Social Principles asserts that “The United Methodist Church does not condone the practice of homosexuality and considers this practice incompatible with Christian teaching.” In the 46 years since this was adopted, the church has never specified why this is “incompatible with Christian teaching.” However, in defending this position, “homosexual practice” is repeatedly labeled as contrary to biblical teaching. It is, in fact, true that there are a few—perhaps seven—biblical passages condemning same-gender sexual relationships. The most significant of these is probably the words in Romans 1:26-27 that speaks of how those who rebelled against God were given up by God” to dishonorable passions. Their women exchanged natural relations for unnatural, and the men likewise gave up natural relations with women and were consumed with passion for one another, men committing shameless acts with men and receiving in their own persons the due penalty for their error.” A condemnation in Leviticus even calls for same-gender sexual acts to be punishable by death. I am less interested in that then I am in the larger assumption: If a moral teaching is in the Bible, it is, for no other reason, binding upon faithful Christians. In the case of the Confessing Movement, it is the fact that these biblical teachings are repeated throughout a lot of church history. True enough. that kind of reasoning is deeply flawed. teachings in part of the Older Testament, such as Leviticus. Do members and particularly leaders of organizations like the Confessing and Good News movements consider themselves to be literalists? I doubt it. But insofar as they allow biblical literalism to be a serious ground for the harsh Traditionalist Plan, we have to question the integrity of the legislative effort. grandeur and grace of God. A failure to take important facts into account. Moral judgments are at the intersection of values and facts. Our values are grounded biblically and inspired by generations of faithful Christians. But they must be translated into the factual world and universe — context matters. The deep scriptural values at the heart of our faith must not be captive to the factual views of biblical writers. Some of those writings convey views that remain valid, even thousands of years later—particularly those dealing with human nature and our tendencies toward self-centeredness. In dealing with sexual issues, the United Methodist Social Principles are on solid factual ground in warning against the moral dangers of sexual exploitation and disconnecting sexual expression from love. But our traditionalist friends overlook factual realities in same-gender relationships. What are these: In the first place, there is a growing body of evidence that sexual orientation is, for most people, a given and not a choice. The biological basis remains unsettled, but many (I think most) LGBTQ people speak of this as something they have always experienced. Moreover, there is a settled consensus among most members of the psychological professions that efforts to change one’s sexual orientation arei usually futile. Tragically, LGBTQ people who have tried but failed have been led to self-hatred and sometimes even to suicide. Perhaps the most important fact is that there are gifted, grace-filled Christians living morally disciplined and relationally caring lives. When the 1988 General Conference established a Committee to Study Homosexuality, it hoped that all of the factual scientific questions could be unearthed. That didn’t quite happen, but in its various studies and hearings, the Committee metC with numbers of gay and lesbian Methodists who were evidently very good people. Increasingly that is being discovered today in large numbers of churches and families with LGBTQ children and grandchildren. It is a mystery to me why the Traditionalists can’t see that right in front of our eyes! At the very least, that fact should lead to greater humility in categorizing all LGBTQ people negatively. The line in the Social Principles that treats homosexual “practice” as incompatible with Christian teaching does not, as stated above, give specific reasons. But its point is clearly to identify this as sin—always and necessarily a sin. We’ve already pointed out that such a judgment cannot be based on biblical literalism. But that language pushes us to think more clearly about what “sin” is. There is a good deal of theological support for the view that sin is in what separates us from God. That can’t mean ”literally so” because God is already present everywhere. Nor in Christian faith can it mean that sin is our failure to earn and deserve the grace of God. God’s grace is present all the time, quite apart from our deserving. But sin is real. Perhaps the best way to phrase this is to speak of human actions and attitudes that create obstacles to our receiving that divine grace. Can sexual actions and attitudes be sinful? Of course! But they don’t attach to sexual orientation per se. The “Traditionalist Plan,” largely adopted by the special General Conference and advocated by the Confessing and Good News movements, not only continued existing legislation prohibiting the ordination of LGBTQ candidates for ministry and made it a chargeable offense for clergy to officiate at same-gender weddings, but it sought to rigidify enforcement of these prohibitions. Some of that has been ruledr unconstitutional by the church’s Judicial Council, but the Traditionalists clearly want to increase legal controls. The basic rationale seems clear enough: Our covenant with one another is expressed in our laws, and everybody should be accountable for obeying them. But not so fast! Do church laws related to LGBTQ issues authentically express the deep meaning of our covenant? Legalism is law required for its own sake, just because it is the law, and not because it expresses an underlying theological or moral truth. John Wesley himself disobeyed Anglican church law when it conflicted with his conscience. When church law is rigidly enforced, it risks making it difficult for people to follow the leading of the Holy Spirit in acts of ecclesial disobedience when church law is deemed to be wrong. The traditionalists want to prescribe definite and harsh penalties, removing all discretion from bishops and church courts. We do well to remember St. Thomas Aquinas’s admonition to rulers not to enact laws that many oppose. be cautious in imposing laws that are not supported by a clear consensus. As noted above, the traditionalists and the current “incompatible with Christian teaching” consider same-gender sexual relationships to be sinful, and in the Book of Discipline, such relationships are singled out for special condemnation in church law. Despite rhetoric about loving the sinner while hating the sin, LGBTQ people are stigmatized. In some parts of the church, such stigma gets translated into rejection by the community—despite the Social Principle imploring us not to reject or condemn. Fact is, that happens and is deeply felt by those who are hurt by it. One especially poignant illustration of the problem occurs to me. I have known children of gay or lesbian couples. Is the church telling those children, in effect, that their same-gender parents are living in sin? How are those children to be regarded in Sunday School and youth groups? And when two people of the same gender clearly love each other why shouldn’t the church recognize and celebrate the moral dignity of their union? When such recognition is denied through church law, isn’t that a profound statement of rejection? Very large numbers of young people have turned away from American churches. In part this may simply reflect anti-institutional feelings. But young people often have gay and lesbian friends and simply cannot understand why the church is stigmatizing them. When young people sometimes judge the church as hypocritical, this often is cited. No doubt, there are also young people who fully accept current UM teaching about same-gender sexual relationshps, particularly if they have grown up in more conservative churches. But even these youths are not likely to remain in those churches for the rest of their lives. In some measure, the issues now confronting the church are generational in character. And, say what we will, the younger generation is the future of the church.